Graham Napier rewrote the record books by hitting the most sixes in a Twenty20 innings on his way to the highest individual score in the competition. The Essex all-rounder, 28, hit 16 sixes as he blazed his way to an astonishing 152 not out off just 58 deliveries. Added to his 10 fours, he had a strike rate of 2.62 runs per ball as Essex annihilated Sussex by 128 runs. Brendon McCullum's 158 not out in the first ever Indian Premier League game remains the highest Twenty20 score. Napier did have the satisfaction of breaking McCullum's all-time Twenty20 record of 13 sixes in an innings and also removed Mark Ealham's domestic mark of nine from the record books. The previous highest score in English domestic Twenty20 had been Cameron White's unbeaten 141 for Somerset against Worcestershire in 2006. 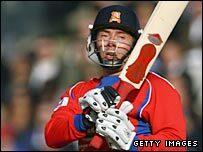 Napier toured Malaysia and India with the England academy in early 2004 and was picked in the initial 30-man squad for the Champions Trophy later that year, but injuries subsequently disrupted his career. Amazing innings... but only England material if he starts to produce consistently good OD performances. After winning the toss and deciding to bat Essex started comparatively sedately before Napier, whose previous highest Twenty20 score was 48 not out, came to the crease. James Foster kept him company with 48 off 23 deliveries but he could not compete with Napier, who produced a marvellous display of clean hitting. He took 29 off the final over, bowled by former England man James Kirtley, as Essex posted a formidable 242-3. "It was awesome, fantastic. I just started to see the ball better, middled one or two and then got into a rhythm," said Napier. It was a text-book demonstration of why Twenty20 has rapidly become lodged in the country's sporting consciousness and Sussex needed to get off to a flier to stand any chance of winning. Their reply saw them ahead of Essex's comparable score right up to the halfway stage, but they never looked likely to be able to match Napier's late fireworks. Essex's Jamaican-born paceman Maurice Chambers picked up three quick wickets, including two in two deliveries, the latter a beauty to bowl Murray Goodwin for 23, to leave Sussex 66-4. With Pakistan leg-spinner Danish Kaneria weaving his magic Sussex were unable to accelerate and Kaneria and spin partner James Middlebrook picked up five victims between them as Sussex subsided to 114 all out under the lights in Chelmsford.